The World War Two code-breaking site Bletchley Park has been awarded £460,500 by the Heritage Lottery Fund (HLF), with the possibility of £4.1m more. The money will go towards the maintenance and development of the historic site, whose code-breakers are credited with helping to shorten the war by two years. The site fell into a critical condition after the war and was only recently given £930,000 by English Heritage and Milton Keynes Council to repair and restore buildings. Other funding has also started to trickle in. Mathematician Alan Turing was among the staff who helped to break the German Enigma code. The money will be used to transform the Bletchley site into an educational centre focused on the work that went on there, including Turing's contribution. Colossus machines, the world's first computing devices, were used at the site. 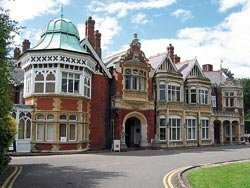 The Bletchley Park Trust can now progress to the second round of the HLF application process, and has two years to submit more detailed plans to apply for a further £4.1m. The Trust wants £10m in total. Simon Greenish, director of the Bletchley Park Trust, said, "The support offered by HLF is a landmark event for the Trust in our quest to provide a permanent future for Bletchley Park that will enable us to work up detailed plans for the education and enjoyment of future generations. "Since 1992, the Trust has fought fiercely, tirelessly and righteously for this victorious moment." But he added there is still a long way to go before the Trust reaches its goal. Dr Sue Black, head of department of information and software systems at the University of Westminster and a Bletchley Park campaigner, said in a blog post, "This is not the beginning of the end, but the end of the beginning. Bletchley Park still needs your help. On top of the HLF money it still needs £250,000 per annum operational funding for the next five years, plus another £6m funding." Carole Souter, chief executive of HLF, said, "Bletchley Park is an extraordinary part of the UK's heritage. Its story should be much more widely known and appreciated. We also recognise the importance of preserving the site as a tribute to the men and women who worked there with quiet and tireless dedication during World War Two. Without their dedication, our nation's history might have been a very different one."